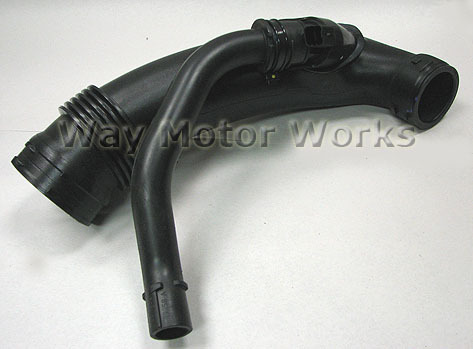 JCW turbo inlet hose for R55 R56 R57 MINI Cooper S JCW. This is the hard plastic smooth tube that goes from intake air box to the inlet of the turbo. This hose will fit ALL MINI Cooper S JCW 2007-2010, will NOT fit 2011 and newer MCS. Great upgrade over the stock rubber hose to help improve airflow into the turbo. If you want to use this on a non JCW MINI Cooper S a seal must be added to the turbo inlet to size it to fit.